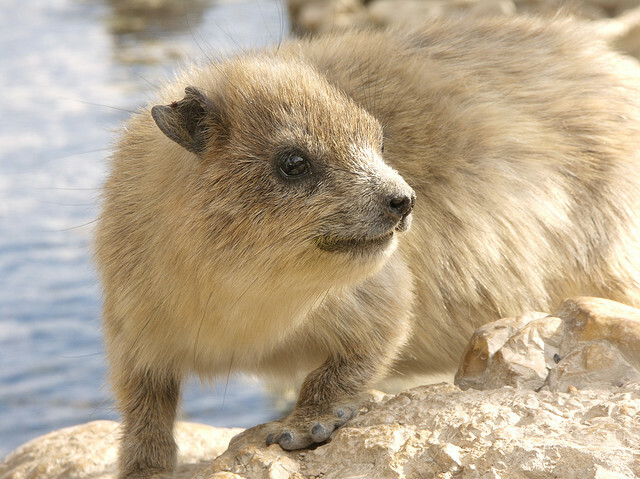 The Hyrax may look like a guinea pig to the casual observer but looks can be very deceptive. 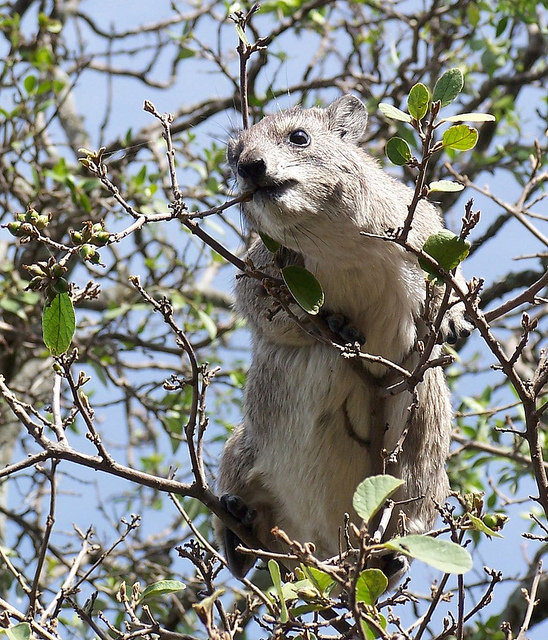 It has even been called the rock rabbit but its family tree is much stranger than you might expect. Its nearest living relatives are the elephant and, bizarrely, the sea cow. There are four species in its own special order (Hyracoidea) and they all live in Africa and the Middle East. 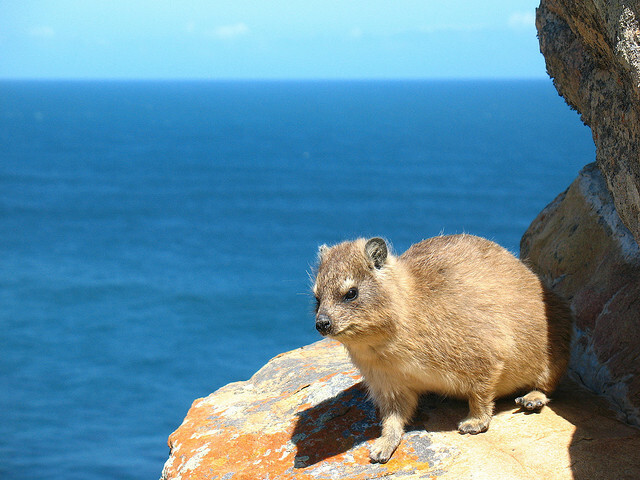 As their name suggests they like to live in areas with plenty of rocky crevices in which they can take cover when attacked by predators. 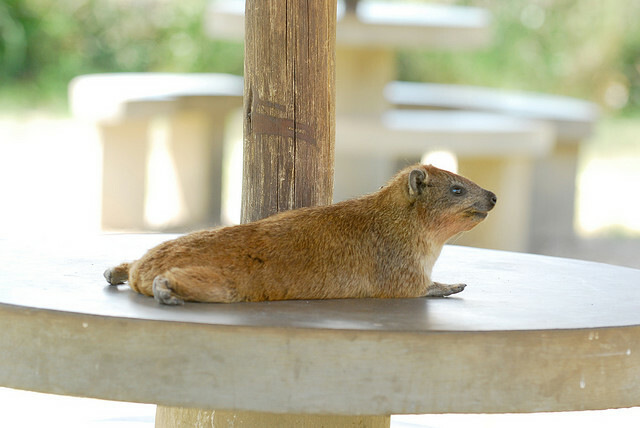 You might think it lazy, but the rock hyrax loves to rest. Almost all of the time. 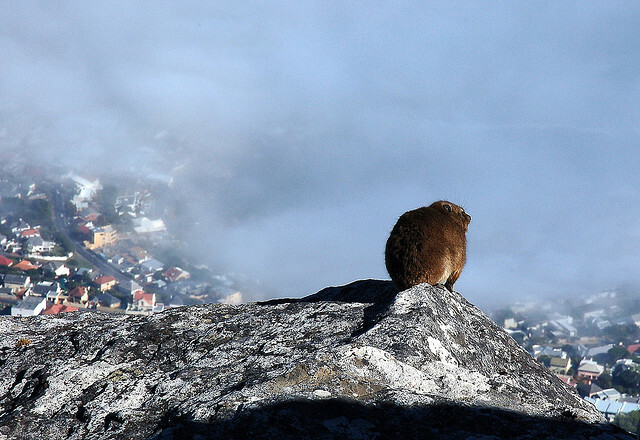 Yet this is due more to their complex system of thermoregulation than innate lethargy. 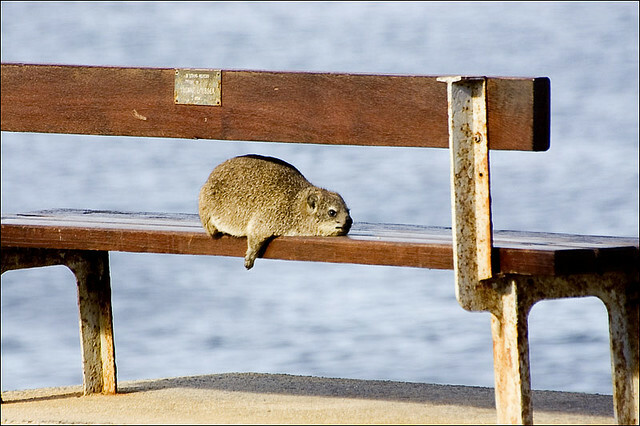 They often look as if they have simply conked out but there is usually another hyrax watching for danger. 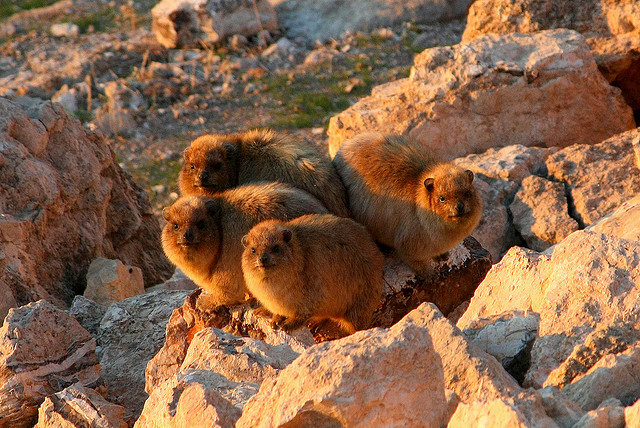 They are social animals and live in groups, sometimes numbering up to eight. 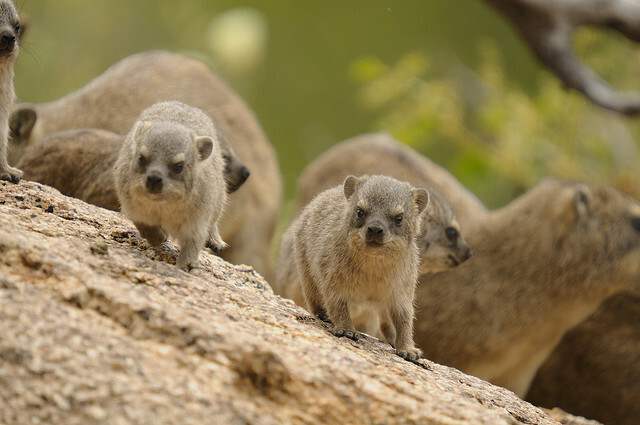 Like the meerkat (some say they look like fat versions of the mongoose species) they warn each other of approaching danger by standing on their hind legs and giving out an alarm call. 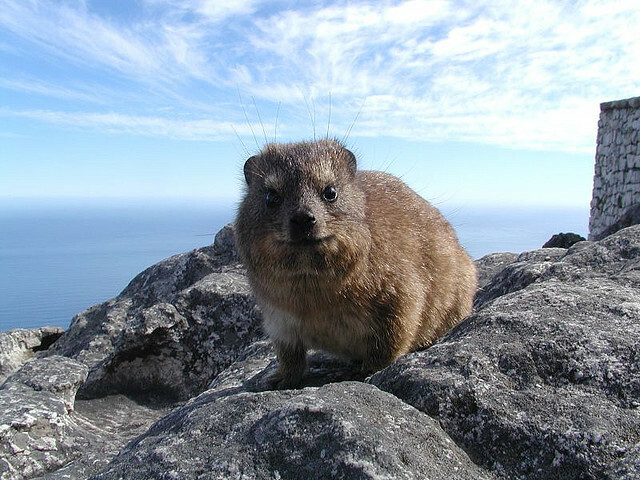 A somewhat squat and heavily built creature, the rock hyrax is usually about 50 centimeters in length and weighs in at a health 4kg. 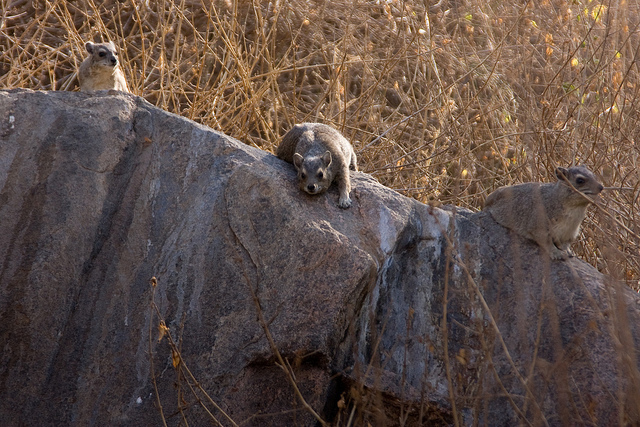 Due to the extent of their habitat their fur color can vary from a grey to a light brown. 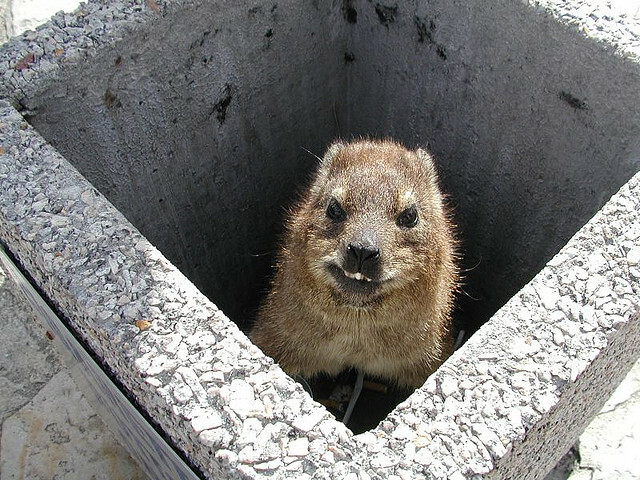 Their size varies, too, from habitat to habitat – it is thought that it has a direct relationship to how much rain falls in the area. 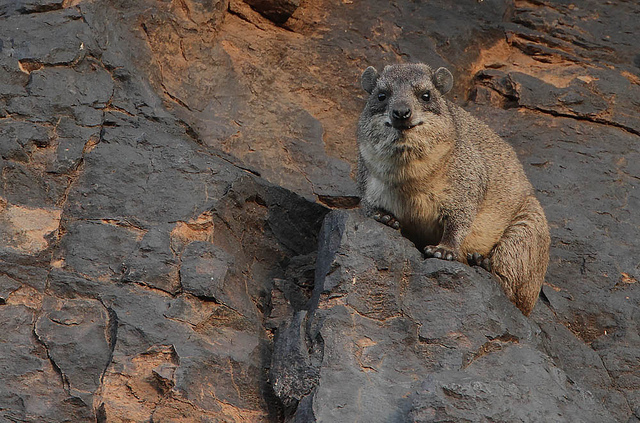 It is easy to scratch one’s head and wonder just how the rock hyrax and the elephant could possibly be related. 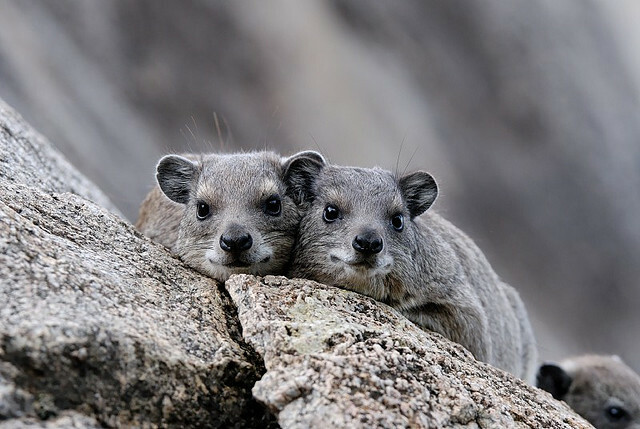 Yet when they bare their long pointed incisors (which do look a lot like tusks) one can possibly see the connection a little more clearly. Surely there must be more to it than that? So how exactly are they related to the elephant and indeed the sea cow? The order makes its first entry in to fossil record an astonishing 37 million years ago. Some were tiny, mouse sized creatures. Others grew to be the size of a small horse. These giant hyracoids evolved in a number of different ways. It is thought that some species took to the water and that this gave rise to both the elephant and the sirenian species, such as the manatee and the dugong. They share a number of traits with elephants still. They have toenails and thin-skinned pads on their feet. 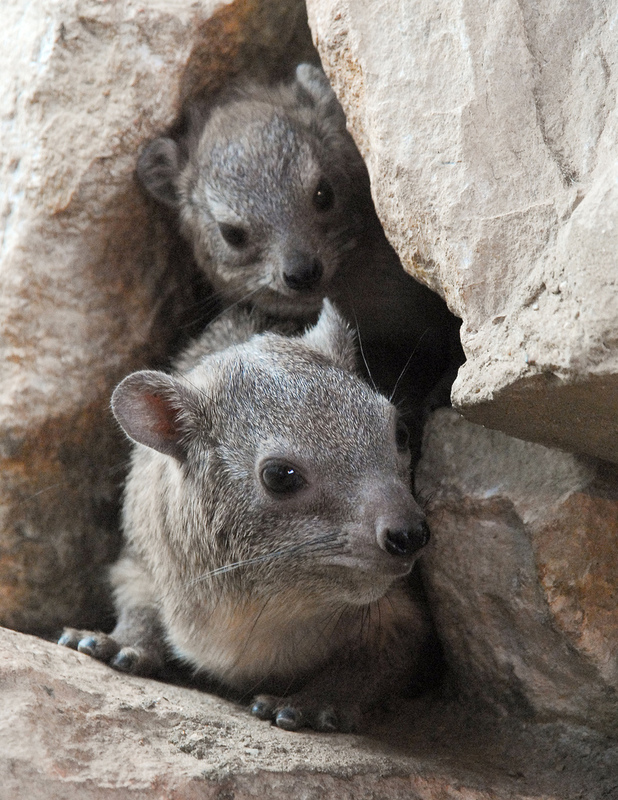 Like their large eared relatives they also have excellent hearing – and a good memory! Another feature that they share with both elephants and the sea cow is that their testes are internal – permanently resident in the abdomen. They also live in herds with a very well defined social structure. 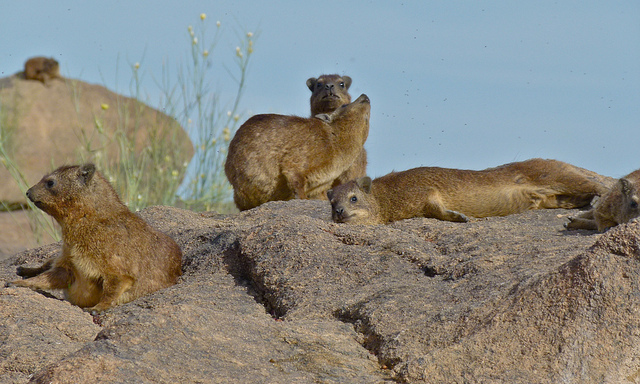 Up to 80 hyrax live together in a herd yet this is divided in to smaller flocks which ensures that more than one male can hold sway in a herd. 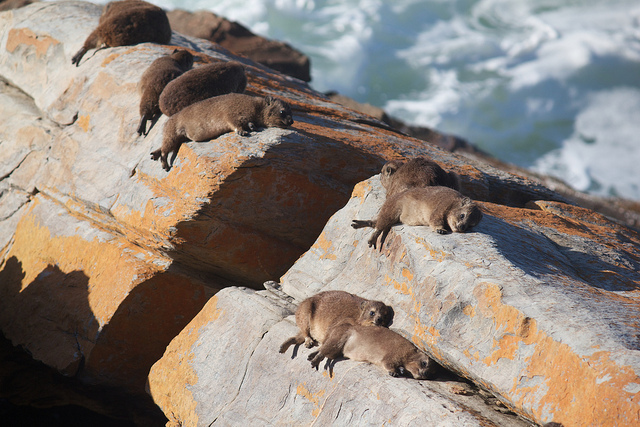 These smaller flocks are usually made up of around 15 adult females (all of which are related) and a single male together with any offspring. 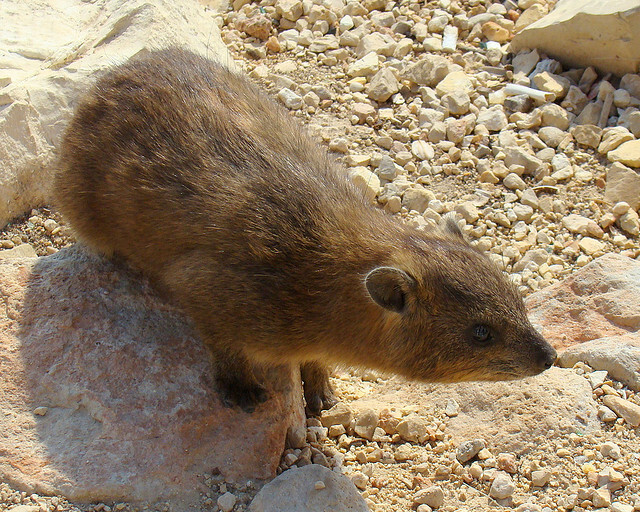 The male marks his territory out using something unique to the rock hyrax – a dorsal gland. This ensures that each male within a herd knows exactly where he can and cannot venture. The herd is together for safety from other creatures, but boundaries within are clearly delineated for the safety of the species itself. 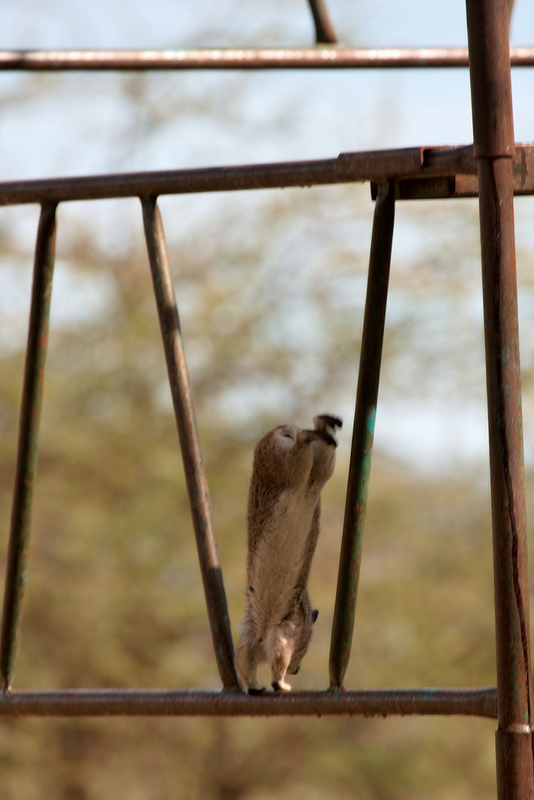 They have plenty of predators to watch out for in Africa at least (their sentry system is reportedly so successful in Israel that they are hardly ever predated by larger animals). Their enemies number a number of species of snakes not to mention eagles, leopards and caracals. 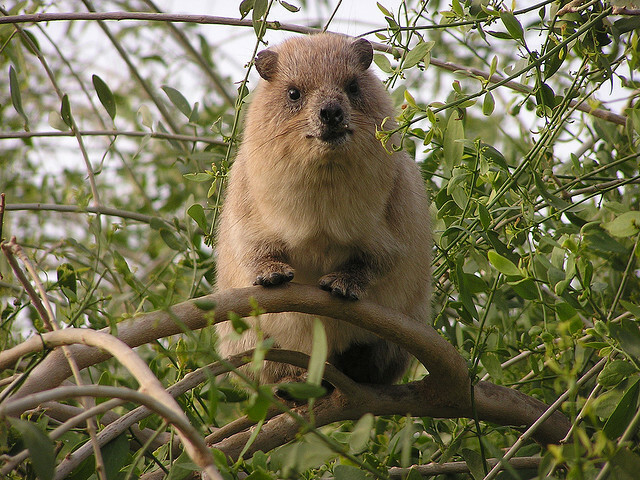 Although the hyrax is largely a herbivore it has also been seen to eat small insects. 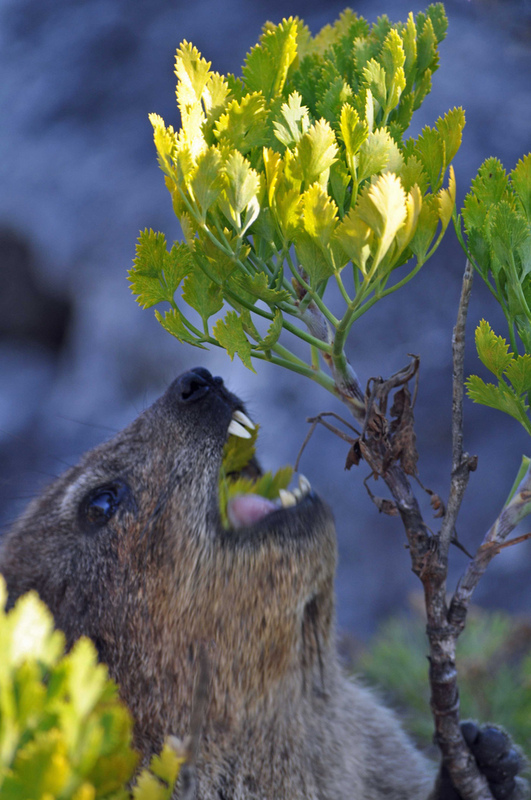 Mostly, however, it eats broad leafed plants and a variety of grasses. 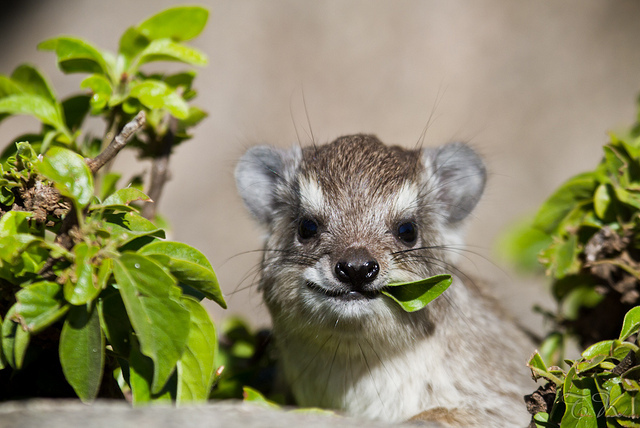 It also has another surprise up its sleeve – despite its less than gymnastic frame it is a good climber and will often take to the trees in order to make a meal of its tasty foliage, citrus being a favorite. They might not win any medals in an Animal Olympics but they occasionally look as if they could be contenders! ...and don't go rummaging around in the bin - that job's already taken. 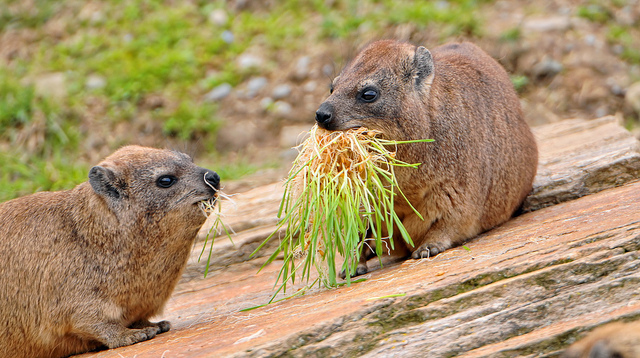 As a result of their moist diet the rock hyrax can go without water for several days. 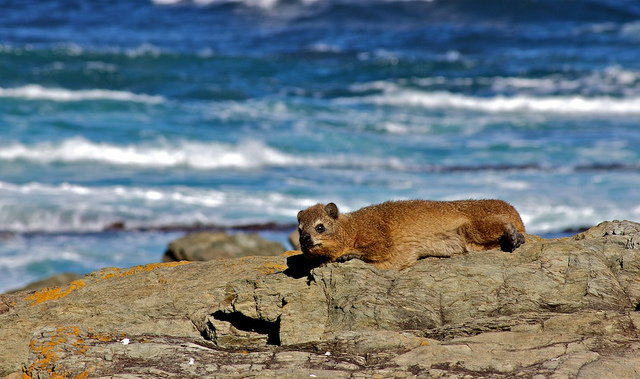 This is just as well as their predators, such as the puff adder and the Egyptian cobra are known for their patience. They are more than prepared to play the waiting game, remaining in the area for a potential meal to reappear from the crevice in to which it has scurried to hide. 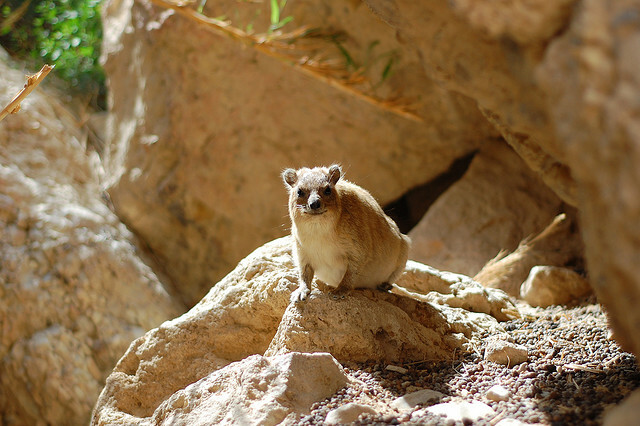 What does a rock hyrax like best? Sun bathing is the simple answer. 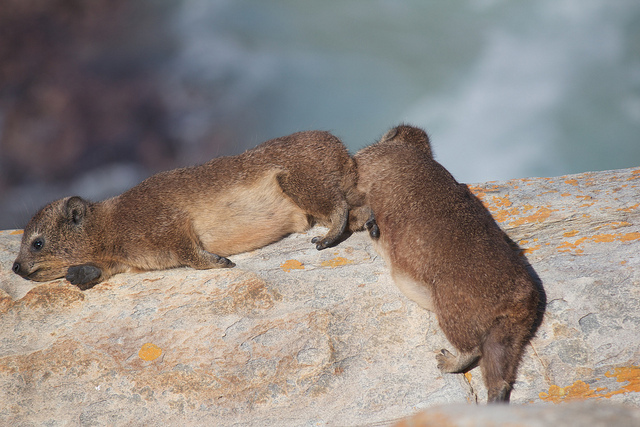 An average hyrax will spend 95% of its time resting and where better than a sunny ledge with one of the family standing guard? 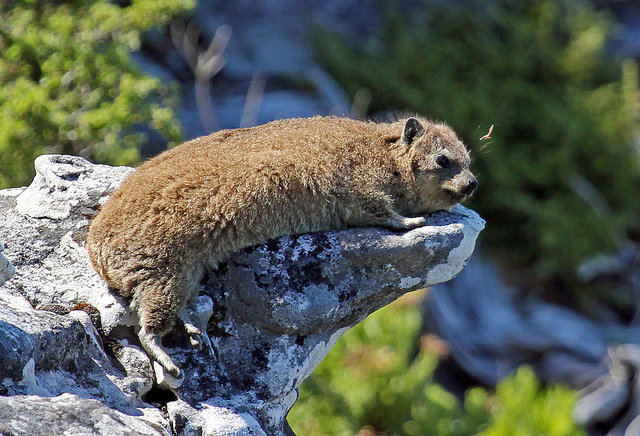 Anywhere a rock hyrax can extend the length of its body is considered suitable. 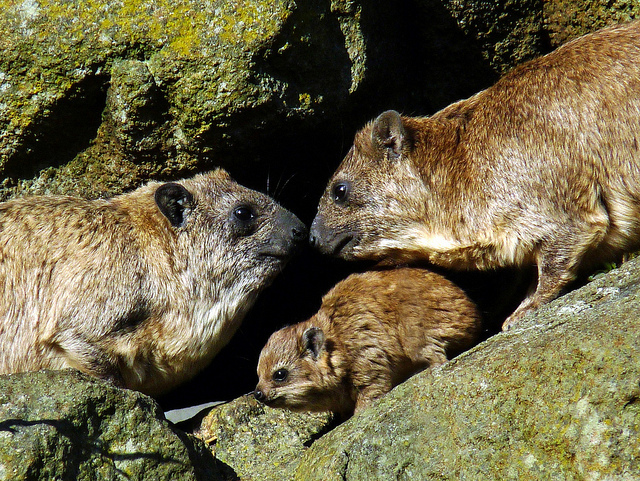 They never stray more than 50 meters from their sanctuary so with a high warning trill from a family member they can be safe (after a lightning scamper) in seconds.